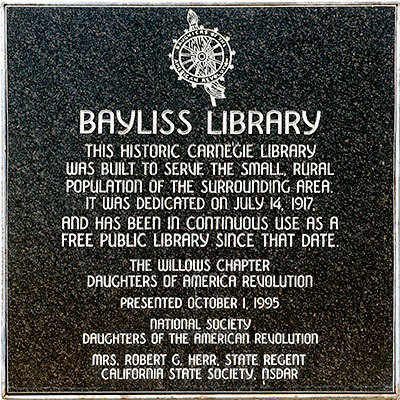 In 1914 Bayliss benefited from the new California policy of establishing small library "stations" in rural areas, often in private homes. Bayliss residents, with the support of Glenn County, sought and received a $4,000 Carnegie grant. The Bayliss Carnegie Library building was designed by William H. Weeks in the Classical Revival architectural style. It is unique among California Carnegies, located "at a crossroads" in a rural unincorporated community on Blue Gum - Bayliss Road (County Road 39 between Willows and Chico). 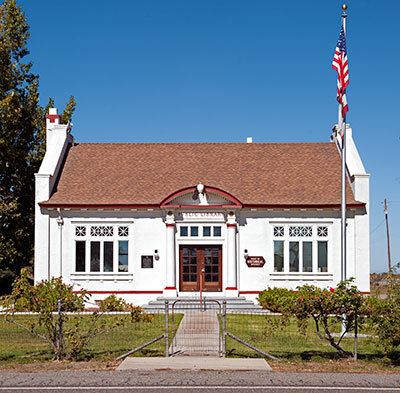 Among a few residences, a dairy farm, and a volunteer fire department, the small red-trimmed white stucco library identifies the community which in earlier years boasted a hotel, livery stable, country store and elementary school. The building continues to operate as a branch of the Willows Public Library. This historic Carnegie Library was built to serve the small, rural population of the surrounding area. It was dedicated on July 14, 1917, and has been in continuous use as a free public library since that date. The website Carnegie Libraries of California contains much information about these libraries.